John Cohen at Merle Wood & Associates tells me of another $1 million price drop on the 53.04m motor yacht Sea Bowld, a joint listing with Merle Wood and Stuart Larsen at Fraser Yachts. Delivered in 2004 by the Oceanfast yard, Sea Bowld was designed by Sam Sorgiovanni for a very experienced yachtsman as a practical but low maintenance yacht to operate in high sea states at high speeds, and to go anywhere, anytime, yet with long range at slower speeds. Her classification from Germanischer Lloyds is the highest possible for a high-speed superyacht, and she has amply proven her sea going ability already with a trans-Pacific passage, Caribbean and East Coast cruising. 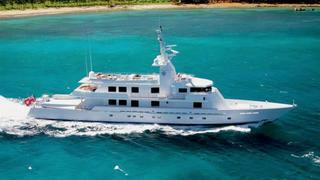 MCA compliant, Sea Bowld can accommodate 10 guests in five staterooms including a private owner’s deck. Lying in Fort Lauderdale, Sea Bowld is now asking $11.9 million.